I am going through a cycle in my own learning where I am taking in lots of information and trying to process it as I construct meaning and make connections across a few different related concepts. My mind is sifting and sorting as I try to learn and ultimately, grow both personally and professionally. As I try to inquire into each, I can’t help but make big connections as I explore these concepts individually and in tandem. I have lots of notes on all three and loads of ideas…but my understanding is still growing even though I’ve been at it for months. My inquiry, ideas and thinking are in process, but they are not at the point where I could possibly articulate the new understandings that I am building. So, my current state has got me pondering and wondering about meaningful learning and the timing of summative assessments. What of the learner who is still making connections and processing their understanding and somehow they are supposed to complete a summative assessment because it’s “the end” of a unit? I was very provoked and inspired by the extremely reflective and insightful blog post recently shared by Sam Sharrett on summative assessments. Recently, I also participated in a webinar hosted by Rick Wormelli. Wormelli got me wondering when he questioned the mixed signals we are sending in the “rush to quantify learning”. I am wondering this: if differentiation is integral to teaching and learning, why is it typical practise to give the summative assessment to all learners at the same time? Even if we are differentiating the task, what if the timing isn’t right for some or all learners? How do we differentiate time in a system where time is often portrayed as the finite villain? It bothers me that the program of inquiry can become like a series of Amazing Race episodes, with learners racing from one line of inquiry to the next with the hopes of making it the big conceptual aha/final destination– except in this case, there is no million dollar prize at the end – just teachers scratching their heads and students lining up to start the race all over again when the next unit begins. And furthermore, how many of our students are eliminated during the race because they run out of time? I must say that one of the big frustrations that I felt when I was in in the classroom full time, and one that has been shared with me countless times by colleagues and other educators I’ve worked with as a PYP workshop leader is the constraints that 6 transdisciplinary themes in one school year puts on learning. Is the requirement for learners to experience all 6 transdisciplinary themes REALLY about the learner? Six linear units with fairly firm start and end dates on the curricular clock doesn’t give the learner who isn’t ready to move on yet the time they may need to let their learning percolate. What about the learner who can’t process all that rich conceptual information within a 4-6 time-frame? Units of inquiry have a way of marching forward, one unit wrapping up as the other is ready to begin…the relentless calendar reminding us that a school year is finite and that learners must move on, ready or not. I hope that as the IB revisits the PYP over the coming months that serious consideration will be given to making learning more flexible within the PYP curricular framework. The framework needs some refreshing – it’s been 15 years with no change – except some minor tweaks to a couple of theme names. While I appreciate the value of each unique transdisciplinary theme, I do believe that “coverage” of all six themes across one school year is not always learner centred and can actually be counter-productive to the heart of the best-practise inquiry based pedagogy that the PYP is built on. Schools should be able to make more flexible choices about the ebb and flow of units and which themes are best suited to learners at different developmental stages. Instead of a rigid matrix, perhaps some clear guidelines about minimum criteria around planning curriculum within the framework might help alleviate some of the crunch I know many teachers, and as a result, learners feel. This might give learners who need time to truly explore and inquire into and across transdisciplinary concepts the time they need to process, consolidate, apply and maybe even really have the time to take meaningful action for and from their learning. When educators see themselves as learning architects who are designing learning spaces built on a strong curricular foundation for learners to inquire and construct meaning while developing skills, they must be open to exploring how to create urgency in learning by both igniting and propelling the urge to inquire. How do learning architects create urgency within curriculum? First, they define the inquiry purpose by clearly knowing what knowledge is essential for the learner to come away with after all is said and done. They do away with all the fluff – there’s no urgency in that. Then, they design provocations, opportunities and open-ended engagements that ignite the fire of urgency by inviting learners to connect, explore, wonder, puzzle, collaborate, problem solve, think and apply. They carefully plan opportunities for skills that fit the concept to be introduced, practised and/or mastered. The learning architect also knows the importance of sharing/modelling their own learning urgency by literally selling the curriculum to the learner so they buy in with their learning currency. Curriculum is much like stock – learning architects are the designers and marketers of that stock and learners are the investors. The more the learner feels the urge invest in the curriculum stock, the higher the learning yield will be. Finally, learning architects know that less IS more. Because they see curriculum AS architecture, they understand the importance of careful design in the learning process so that learners have plenty of space to explore and construct meaning. Learning architects do away with the seemingly but usually unconnected laundry list of activities and instead design open learning structures that invite the learner to take on the meaning construction process. The learning architect coaches and guides the learner by carefully providing the structural support that a learner needs to grow and thrive. “I think…”, “I feel like …”, “Try this…”, “It sounds like…”, “I’m not sure how exactly to describe it, but it’s like…”, “Ahhh…”, “I’m not sure…”, “There has to be…”, “It is…but it isn’t…”, “It’s not…”, “How do you…?”, “I think you are right…”, “What do you think…?”, “We need to think about it in a different way…”, “Can we…?”, “Is that because…?”, “Ohhhh!”, “Ooooo…” …. All of the above statements are the inquiry utterances of a group of adult learners engaging in inquiry learning at a recent inquiry based learning workshop that I had the opportunity to facilitate. One of the biggest misconceptions about inquiry based learning is that it is only about asking questions and finding answers. Go back and read the list of utterances again. Inquiry is so much more than asking questions and seeking answers. According to dictionary.com, the second definition they provide for stance is: a mental or emotional position adopted with respect to something. So, inquiry is a mental or emotional position we adopt with respect to learning. Inquiry tension lies in the mental or emotional position of the stance. When we think, feel or believe we have to figure something out, or find out the truth by either confirming something we already believe to be true or dis-confirming something we’ve assumed to be true, or figuring out something that is totally new, we are activating the inquiry stance. As educators, it is our role to be the inquiry architects as we take learners on a journey through an inquiry cycle (there are many! just pick one or make your own hybrid!). Many times I hear other educators lament, “but they just don’t ask questions. How do I get them to ask questions?” Therein lies our first mistake. When we limit the inquiry stance to just asking questions, we limit the potential for meaningful and contextualized inquiry stance learning. Take a step back and really listen to what the learners in your classroom are saying. If you don’t hear anything, then perhaps the flaw lies in the designer and not the learner. Inquiry begs us to examine and challenge our own beliefs and assumptions (our own mental and emotional position) about teaching and learning. Do we see ourselves as teacher or as learning architect? Learning “INexperience”…from lemons to lemonade! Summer is here in this part of the world and with it comes heat, and heat brings thirst. What better way than to quench your thirst with a nice, cold glass of lemonade. This is what my 9 year old twins decided about a week ago. They have toyed with the idea of opening a lemonade stand for the last few summers but it never quite came to fruition. Well, during my absence from home at the start of the week they opened a lemonade stand, and I am in awe of the learning that is happening as they independently follow through with and implement their plan. They are learning “IN experience”, which is really what the heart of inquiry based learning is all about. It’s kind of ironic that learning “IN experience” can also be read as “learning inexperience”. Both statements are true to inquiry – inquiry is all about taking on the unknown and making it into a known – both “inexperience” and “IN experience”. The kids started with an idea, prepared a plan and took action: they researched the cost of lemons and the other ingredients they would need, they came up with their lemonade recipe (the best I’ve ever had! ), they made a marketing plan, gathered supplies, and then they set to work. In implementing their plan, they’ve learned what it means to break even, make a profit and take a loss; the importance of counting your money just right; they’ve learned about supply and demand, and quality control; ways to drum up business when it is slow, and what it means to have a slow business day. 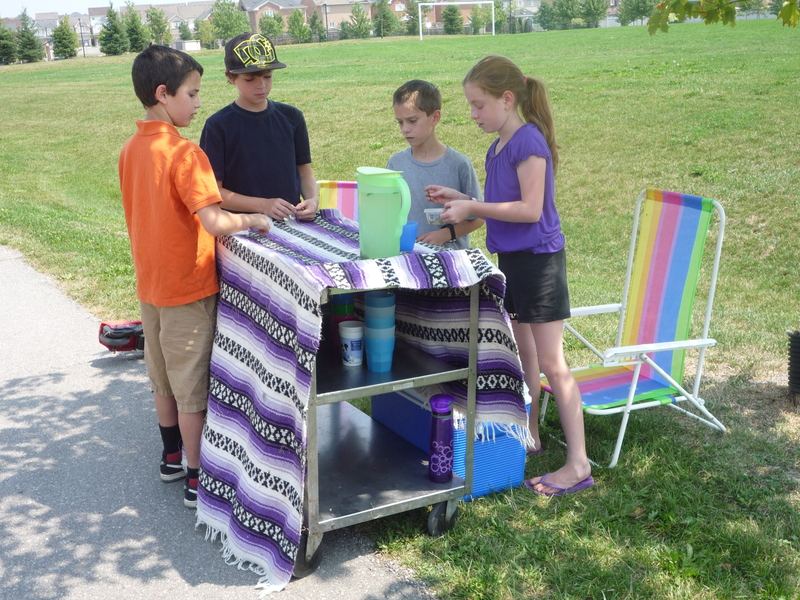 Best of all, they’ve learned team work as they’ve relied on each other and the two neighborhood friends who’ve set up an iced tea business along with them. None of this learning happened at a desk or under the carefully structured school learning environment. It happened because they had an idea, worked through their own inexperience IN experience by choosing, acting and reflecting. All along the way they continue to make decisions about their lemonade business to improve and grow it. The best thing of all is that I have had absolutely nothing to do with this little learning venture except to buy myself a glass of lemonade and toast the success of their endeavour. So what do you do when life throws you lemons? …Make lemonade of course! Thanks kids! Our Grade 5s are currently inquiring into the concept of sound and its environmental and technological applications. As a part of their inquiry they’ve visited some concert halls to explore how sound is used in a carefully designed space for a specific purpose. As we collaborated in the creation of this new unit in our program we wondered how much the students would really understand beyond the traditional sound basics. Exploring the applications of sound opened the possibilities up quite wide and with 10 and 11 year old learners, we wanted them not only to understand the science of sound – those aspects of sound that don’t change, but also come to appreciate that sound can be harnessed and the harnessing of sound pushes people to new limits, boundaries and change. The summative assessment involves the students planning, designing, constructing and presenting some sort of concert/presentation space. This afternoon I strolled into Grade 5 and landed in the most beautiful form of learning chaos – students spread out across the room surrounded by plans and construction materials. The chatter in the room was buoyant as they created their own masterpieces and inspired each other with their creativity and knowledge. Words like “acoustic baffling” and “resonance” were common place as they truly had become one with their task. Every material chosen had a specific purpose connecting back to enhancing the sound they hoped their space would create. Ideas ranged from traditional to downright innovative. My favorite was a dual purpose flip stage – on one side the stage was padded so that gymnasts and acrobats could perform daring feats to music; on the other side the stage floor was wood and Neil Diamond (a girl after my own heart) was perched in the center ready to belt out “Sweet Caroline.” Inquiry is a beautiful thing – and sometimes, beautiful things require chaos before they emerge. Learning should get messy, and as educators, we need to make sure that we provide a classroom community where that happens on a regular basis. When we step back and provide a learning environment that invites problem solving, innovation, and creativity learning becomes vibrant in ways we never dreamed! So I’ve decided to start a blog, again. I kept a blog once before, when I was teaching a class of Grade 2 boys. (http://dynamitelearning.blogspot.ca/) It was a professional goal for me that year to communicate via a blog with the parents of the students in my class and as a reflective tool for me to document what was going in my classroom. The boys in my class that year loved going home and looking at the new blog entries with their parents whenever I made a post. It made them feel special and it helped them to have meaningful conversations with their parents about their learning. What was even more fun for them was watching the map that tracked where blog visitors came from. By the end of the school year, we had visitors from other places that we weren’t connected personally to, and that fascinated them. The fact that other people, who they did not know from other parts of the world could look in on us and learn from our learning was a huge point of wonder. While I no longer have a class of my own, I view the teachers that I support through curriculum coordination and administration as my class – each colleague requires differentiation just as the learners in my classroom did. Each colleague brings something unique to my day, whether it is a challenge, a problem to solve, a project to work on together, documenting curriculum, realizing school based initiatives, an A-ha! moment, etc. Even though I am surrounded by a team of amazingly talented and inspiring colleagues in a fantastic school, I have a need to process my own learning beyond the walls of my school, so I’ve decided to blog once again. It’s time to chronicle my own reflections, learning, new understandings, wonderings, and challenges. Maybe, just maybe, along the way, others may join me again, whether they are close to home, or across the world. In order to prepare myself for this blog, I’ve spent a lot of time exploring other blogs related to education and more. I’ve been so inspired by the reading I’ve done, and I am now hooked on several blogs, which I will be sure to share here, too! I love learning from other people’s perspectives. I am a constructivist at heart – I like to build my own understanding FROM something. When I first thought of starting up a blog again, I had a lot of doubts. Could I do this again? What exactly was I going to write about? Will anyone care? In preparing myself to do this I’ve gone through my own inquiry cycle. I started by PREPARING – thinking about my purpose and intent. Then I began to EXPLORE by looking at what else is out there in the edublogoshphere. Next, I started to PROCESS by brainstorming ideas around possible blog entries that I might write about. Thank goodness for the notes app on my iphone because I’ve learned you never know when or where an idea might strike! And now I am at the TRANSFER phase – I am ready to take action with my learning by actually committing to writing a blog. Through my inquiry process, I realized that YES, I can do this again (I do love to write after all), and that YES I do have things to write about and that NO, while it doesn’t really matter if anyone else reads this, that YES I do hope that there are others out there who will either identify with me, share with me, or want to challenge my perspective, helping me to grow. That’s what I call a win-win! So…you have to start somewhere and this is it for me…one post down…the PiEd PYPer plays a tune! Passionate about learning, curriculum and leadership. Constructing meaning through blogging.